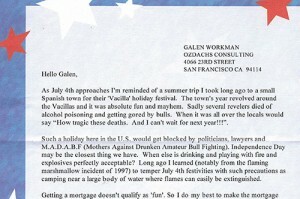 Last week I opened a letter from a business acquaintance who has put me on his mailing list. The envelope had a lump in it, and I expected a pen to fall out. 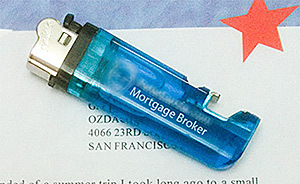 This mortgage broker sent through the mail a cigarette lighter with his logo and business name on it. The lighter fell on my kitchen counter when I opened the envelope, and I jumped in surprise. It wasn’t a good surprise. It was a surprise of horror. I didn’t think of “Oh boy! What a great guy to send me a lighter for my cigarettes.” I thought, “Isn’t it illegal to send flammable material through the mail? How can I get rid of this without starting a fire? Does he think I smoke? Who uses lighters?”… and on and on and on. In fact, I am still angry at having something vaguely dangerous and completely useless to me come through my mail slot. The copy in his letter was strained, too. He started off talking about a Spanish town where people die of alcohol poisoning and getting gored by bulls. 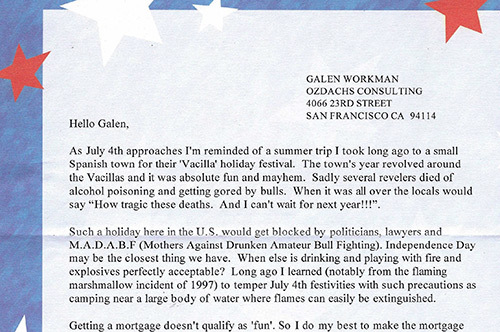 The letter laments that such civic celebration would not be allowed in the US because of prudish politicians, lawyers, and <giggle> “Mothers Against Amateur Drunken Bullfighting” . My mind struggled to make this letter a rational business tool. On the plus side, it did get noticed. Seriously? This gift and the stories in the mailing are supposed to make me trust this man with my financial arrangements for a new home? What makes the scenario worse is that I know that before resuming his mortgage brokering, this man sold insurance for a couple of years. In my mind I can see his lighter burning down a house which was insured by a policy he wrote. And, have no fear, as a mortgage broker this Reconnaissance man can now help you finance a new, unburned home. Don’t send dangerous materials in the US mail. Don’t make fun of people dying for your commerical purposes. Violent deaths in particular don’t sell soap. Don’t write smirking, cleaver text. The humor usually doesn’t translate outside of your office. Snarky comments don’t sell soap, either. I am still shaking my head over this mailing. Have you ever received anything worse? … 2. The prospective mailer of the lighter submits to the PCSC manager a written request for authorization to mail the lighter, accompanied by a legible photocopy of the official DOT notice conveying the approval described in 343.25a, along with a specimen of the actual lighter, the packaging materials in which each lighter is to be mailed, and the number of mailpieces and mailing location; the mailer receives from the PCSC manager a letter approving the requested authorization for mailing. 3. The packaging must be designed to protect the lighter’s sparking mechanism from accidental ignition caused by friction or external pressure during transport. Packaging Instruction 3C in Appendix C must be followed. 4. When presented for mailing, the address side of the mailpiece must prominently display the proper shipping name “Lighter(s)” or “Lighter(s) for Cigarette” followed by the T–Number and the marking “Surface Only” or “Surface Mail Only,” all preparation and packaging requirements in the PCSC manager’s approval letter must be met. A legible photocopy of the PCSC manager’s approval must accompany the mailing at the time of deposit.